Once in a great while a book comes along that changes the way we see the world and helps to fuel a nationwide social movement. The New Jim Crow is such a book. Praised by Harvard Law professor Lani Guinier as "brave and bold," this book directly challenges the notion that the presidency of Barack Obama signals a new era of colorblindness. With dazzling candor, legal scholar Michelle Alexander argues that "we have not ended racial caste in America; we have merely redesigned it." By targeting black men through the War on Drugs and decimating communities of color, the U.S. criminal justice system functions as a contemporary system of racial control--relegating millions to a permanent second-class status--even as it formally adheres to the principle of colorblindness. In the words of Benjamin Todd Jealous, president and CEO of the NAACP, this book is a "call to action." Called "stunning" by Pulitzer Prize-winning historian David Levering Lewis, "invaluable" by the Daily Kos, "explosive" by Kirkus, and "profoundly necessary" by the Miami Herald, The New Jim Crow is a must-read for all people of conscience. Michelle Alexander is an associate professor of law at Ohio State University and holds a joint appointment at the Kirwan Institute for the Study of Race and Ethnicity. Formerly the director of the ACLU's Racial Justice Project in Northern California, Alexander served as a law clerk for U.S. Supreme Court Justice Harry A. Blackmun. Cornel West is the Class of 1943 University Professor, emeritus, at Princeton University and is currently Professor of Philosophy and Christian Practice at Union Theological Seminary. Michelle Alexander’s brave and bold new book paints a haunting picture in which dreary felon garb, post-prison joblessness, and loss of voting rights now do the stigmatizing work once done by colored-only water fountains and legally segregated schools. 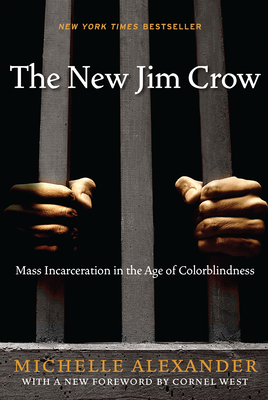 With dazzling candor, Alexander argues that we all pay the cost of the new Jim Crow. "We need to pay attention to Michelle Alexander's contention that mass imprisonment in the U.S. constitutes a racial caste system. Her analysis reflects the passion of an advocate and the intellect of a scholar."